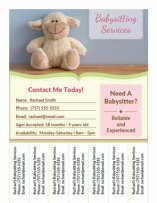 With professionally designed babysitting flyers, you can put your babysitting services above the rest. The designs featured on this page were personally designed by me and created for those of you who want a more branded and professional look. If purchased separately, each template costs only $12.99 each. Or, purchase the bundled set of 3 flyers for $29 - that's a savings of 25%. The bundled set comes with a BONUS Quick Start Guide. 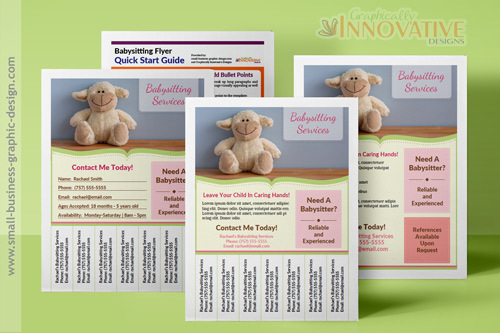 This guide gives you specific tips as to what information to put on a babysitting flyer as well as where you can distribute them. I know that you want to get started putting out flyers fast, so that's why these flyers were created for you to have no guess work involved. You won't get hung up having to learn a new program, decide what font or colors will work, or find a decent picture to use. 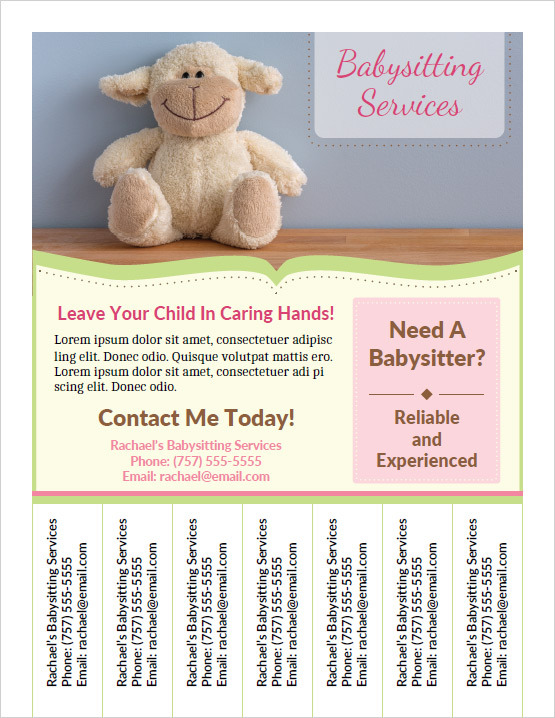 All those decisions can slow you down and that's why these babysitting flyers have preset colors, fonts, and images for you. Find out why I call these designs no-hassle templates. Why are these considered no-hassle template designs? No fancy programs are needed - Each template is a PDF file. So as long as you have a current copy of Adobe Acrobat Reader - which you can download for free - you can easily customize this template and print it on your home printer. All images shown are included for free - The photos in each template were hand-picked for each design and are free for public use under the CC0 license. So you don't have to worry about finding or buying photos to use in the design. The text areas are pre-formatted - All the fillable text boxes in each layout are pre-formatted meaning that the type of font, size, and color is preset and won't change - so you can achieve the same professional look of the demo flyers. It includes the basis for an effective flyer - Have you read my post about the 5 Key Elements For An Effective Flyer Design? I created these professional babysitting flyers with those key elements in mind. So you have the base you need that allows you to include all 5 elements in your flyer. So as you can see, these templates are designed to help you create a great flyer... FAST! All the wording on the flyer can be edited with your own, personalized marketing message as long as it fits in the allotted space. That way you can change the text to suit your needs. For example, if you want the call to action to say "Contact Us" instead of "Call Me Today" you can do so. Click on the "Add to Cart" button featured below the template design you want. After you have successfully made your purchase, you will gain access to a link that will allow you to download your file(s). Need a guide that gives you a practical ideas as to what to say or do with your flyers? I've written up a Quick Start Guide specifically for those of you who purchase the template bundle. That way you can get started fast and make a good impression. This guide is not sold separately anywhere else. Want To Know When New Flyer Template Designs Are Released? Want a Custom Flyer Design? Do you want custom babysitting flyers designed specifically with you or your business in mind? I can make what you envision come to life or create a unique design based on your current branding. The average price for a fully custom designed flyer is $85. Contact me to make your next flyer!